Thank you for celebrating our strong leaders! On Saturday, November 4, the annual Workers’ Bowl fundraiser went off without a hitch. It was a wonderful event filled with many wonderful friends and allies in our movement for decent work. Thank you for your enthusiastic support of leadership education, training programs and internships at the Workers’ Action Centre. If you didn’t get the chance to donate, it is not too late to contribute to the Worker Education Fund! The OEERC is still accepting donations until Friday, November 10. (Tax receipts are available for donations of $10 or more.) You can help support strong leaders like Marjorie, whose story we want to share as a thank you and as inspiration. Marjorie Knight is a working mother, who is very active in her Cambridge community. In each role she takes on, she finds a way to share the message of decent work. As a participant of the Feet on the Ground Leadership Training Program, developed in collaboration between the OEERC and the Workers’ Action Centre, Marjorie is committed to bringing the issues of precarious work to light. The program helps low income and racialized workers across Ontario to develop community organizing skills. Marjorie’s organizing and outreach takes place in the Kitchener-Waterloo area, where she does a lot of education in different communities about their rights at work. Marjorie has proven to be an incredible organizer. She has taken leadership by writing letters to raise awareness among community leaders as well as writing op-eds, which have been published in local papers. Courage and dedication are part of Marjorie’s makeup, empowering her to speak up on television about the problems facing working families. She uses her own experiences of struggling with poverty to express the urgent need for fairness in our workplaces. This past summer, as the public debated the impact of new labour laws, Marjorie helped everyone understand how difficult it is to raise children as a single mother who is a temporary worker. So far, Marjorie has shared information with hundreds of workers about how we can improve working conditions. We applaud Marjorie and the other organizers in the Feet on the Ground program for bringing grassroots momentum to the movement. 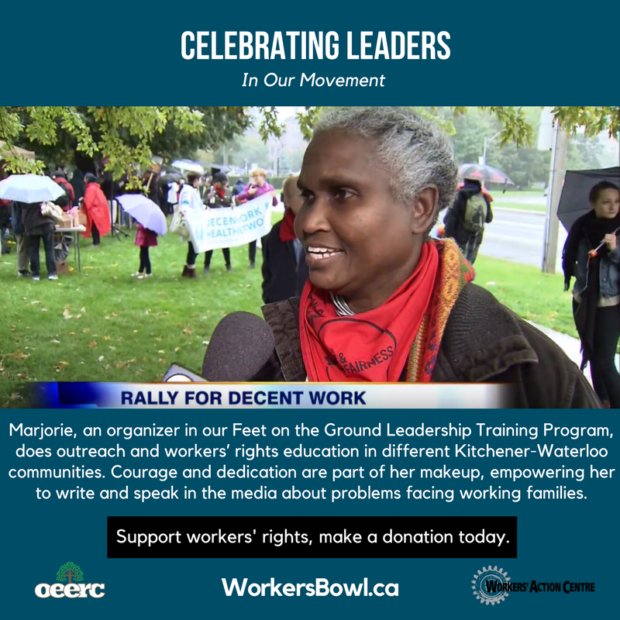 This is just one leadership education program you, our friends and allies, have helped to support through the Workers’ Bowl. Please donate today and also share Marjorie’s story with your networks. Thank you for joining us in celebrating leaders in our decent work movement!